It has been two summers since my last trip to Chaumont. Pending a passport for baby Ian, it was all up in the air until the last minute, but we did end up boarding a plane at the beginning of July to cross the Atlantic. I spent my childhood summers in that little town, and when my father built the house there, it graduated from the place where my heart remained over icy winters to the place I now call home. My mother embroidered each of our names on individual blue drawstring bags when I was a kid, to keep 5 children somewhat organized when we traveled. These bags, packed full, with their drawstrings pulled tight, were piled into the back of the car when we went to Nashville, and also when it was time to go up to the lake. Every summer, soon after school let out in June, we used to pack whatever personal belongings we thought we might need for a summer and head to Chaumont. It was a simple time, and looking back I realize we didn't need much. A little blue bag was really enough. Our time was organized for the most part around work on the boat my father built. It always began with the children being charged with the big job of scrubbing the teak decks of Cambyration from stern to bowsprit with wire brushes before my father would oil them. Nearly every surface in and on the boat was oiled teak, so there was a lot of scrubbing to do. After that, my mother would do her work cleaning and organizing summer provisions down below, and we would carve out our territory for the summer. We each had our bunk which would change from year to year, depending on which straws were drawn and the varying negotiations that took place. The best spot to have was the v-berth. It was most like a regular cabin. It had a door that could close, and I could open the forward hatch and listen to the water lap against the hull while I watched the stars. At the beginning of the summer when we were on deck scrubbing away, there was special kind of joy that came with that initial hard work. It was all in the idea that the whole summer was ahead of us. Sailing camp, always some time spent cruising lake Ontario and the St. Lawrence, and time spent with our summer friends. Every nook and cranny of the small town of Chaumont, New York was there to amble over and through, from the graveyard where I used to ponder the pretty old bottles left on the graves despite the sign forbidding them, to the quiet side roads off main street, where we learned the shortcuts and paths cut by generations of children before us. Arrival in Chaumont meant getting used to the feel of the smooth quarried limestone at lake's edge on my bare feet. We relearned all the best paths during those first few weeks while our feet were still tender. Although the boat house and ship yards were full of sharp stones and surfaces, we still spent a significant amount of our time in bare feet. It was a matter of pride, after all. There were always smooth and rough places, as well as a perpetual puddle that was home to a gang of wasps that used to hang out in the same corner by the club, year after year. We stubbed our toes, stepped on bees and sometimes walked through places we shouldn't have, but that never stopped us going barefooted. The limestone cliffs and stones had a way of retaining the sun's warmth in the evenings. Sometimes I think I can still feel their heat in my bones. Up through my teen years, nights meant stretching out on certain stones to stare at the night sky. There was one behind the pavilion, tilted just so at the water's edge that always was a favorite of mine. I will never forget the complex geography of the cliffs in the quarry. I had every single one memorized, and the first weeks at the lake, I would retrace my favorite paths, taking note in what the elements might have changed over that year's icy winter. The texture, the places where a child could climb, the footholds, the caves, the marshland, the fields and woods beyond down Independence Point, all like a map with endless detail. I had my favorite ledges to sit and survey the landscape once I got tired of climbing. My heart was full and soul replete revisiting these points one by one every summer. A close friend of mine and I were corresponding recently, and she brought up the importance of having a place called home to return to, you know, after the childhood home is gone. A place apart from where our adult lives unfold. 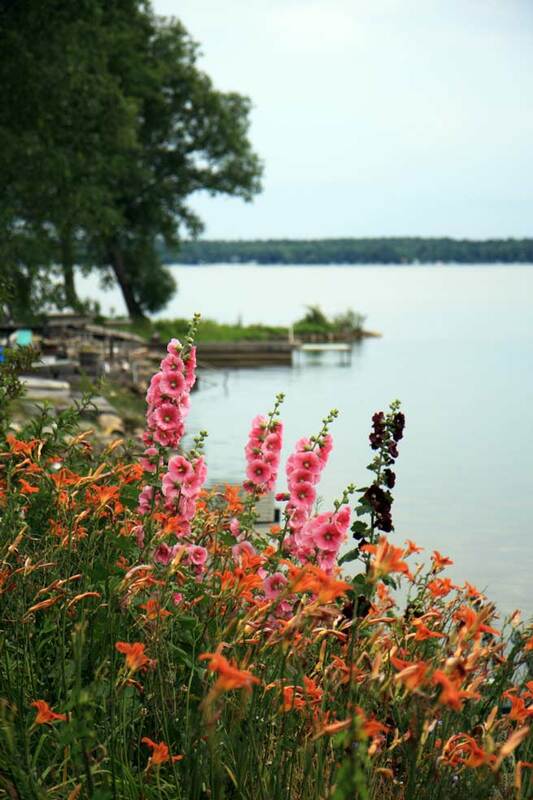 Her place is in Michigan, where she spent her childhood summers. She and her family drive out there from the East coast every summer now. They spend a couple of weeks in the log cabin that her great grandfather built, just as her mother, and her mother before her did. This year, although I was thinking of summers past in Chaumont, I also found myself placing the details of these memories at a safe distance. It is hard to say why. In my mind's eye, it was like my childhood's delectable memories were like my little blue bag packed full, with the white string pulled tight. I was afraid to open it. It's almost as if I was saving myself a certain remorse. Now that I'm back home at my desk in France, I realize that going home with baby Ian brought out that blue bag, and it hovered there like an elephant in the room the whole trip. Opening up and delving into all those memories would remind me how far away France really is, I realize. I know that the little house we now go to in the Alps is most likely going to become the place my son Ian knows by heart. I experienced a vicarious joy watching my brother's children in Chaumont this year. Their relationship to the place is so similar to my own when I was their age. I hope their children will also know the beauty of the home my father built. With that, I leave you with a simple recipe for Salt Potatoes, something I always fix right away when I get to Chaumont these days. I buy the bag with the salt even though I know it's not really necessary, mainly because there's a certain nostalgia in it. Salt potatoes originate in Syracuse, New York, the place I grew up. Syracuse was called the Salt City, because of the trade from the salt marshes there that was done on the Erie Canal. Laborers boiled potatoes in the salty brine from the marsh, creating what we now know as Salt Potatoes. I suppose the contemporary version is a bit sterile in comparison to what they enjoyed, but we love it nonetheless. Scrub the potatoes with a brush, but don't remove the skin. Dissolve the salt in a large pot of water, and add the potatoes. Bring this to a rolling boil, and continue to boil them in the brine until cooked through, 15 to 20 minutes. Check to see if they are done by pricking with a fork. Melt the butter and serve it in a little bowl alongside the potatoes. Salt Potatoes are served plain, part of simple family summer meals. Dressing them up in any way would spoil them. What wonderful summer childhood memories. I can feel the joy in your post, such peaceful moments, too... Will remember this potato recipe for the time of summer in down under. That is really lovely Lucy. A lovely meditation on the meaning of home, of change, of childhood. And of loss. Thank you. You have echoed and enforced this South-child's every-year longings for a Summer in Maine. And though there never was one, this was like remembering the ones I wished I'd had. What a wonderful post and so well put. I know exactly what you mean about opening the little blue bag and being so far away from home. While reading this post, I related in a few ways. I thank you for this thoughtful pause. This is a truly lovely entry. Yes , your son will build his own memories , just as his favourite child's book won't be yours . But your cooking will definitely be a big part of what he remembers ! Wonderful story about your childhood, and the pictures and the recipes are just gorgeous! Beautiful, beautiful writing...thank you for the little journey. That picture is literally worth a thousand posts. I love this entry. My husband's German immigrant family made salt many years ago in the Syracuse area, just as you described, evaporating salty water. The family also still has a camp up in the Thousand Islands region (Redwood). Thanks for your wonderful writing and photos. Mmmm, lovely writing, lovely photos. As a lover of salt potatoes, which I always eat in upstate NY when I visit in summer, I couldn't help but get very excited. Someone needs to do a salt potato blog. Or make bumper stickers: "Have you had salt potatoes?" I too spent my growing up years outside of Syracuse...Salt potatoes, Hoffman's coney's, and Grandma Brown's baked beans were always on the menu at someone's barbecue. Each year we head back to NY to spend the month of July on a small lake outside of Saratoga Springs. 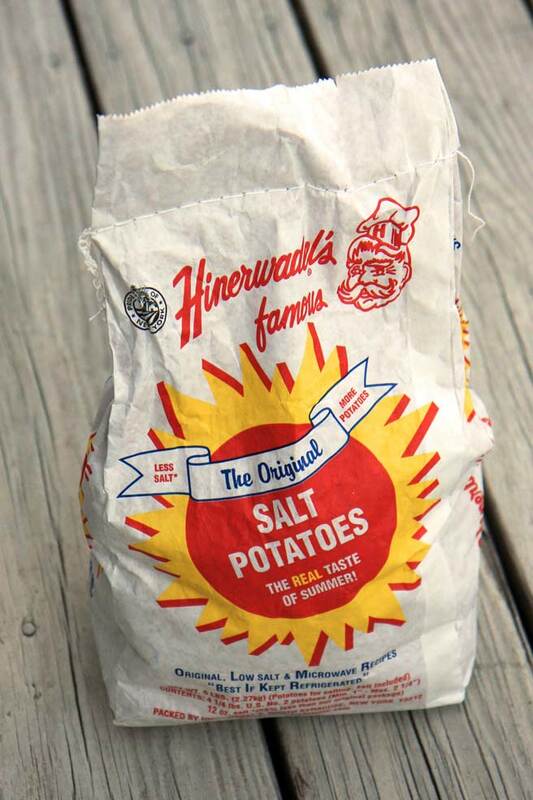 Now sharing the memories with my children---though the salt potatoes are just new potatoes cooked in salt, its the memory of that white bag they come in and the salty film that inevitably mists onto the stove top and takes you back to summer as a kid. Glad I stumbled upon your blog tonight. I've mentioned my admiration and enjoyment of your blog in today's post in LAWN TEA. We ate the same brand back in Syracuse - the amount of salt that came with the bag shocked me even as a kid, but the taste was something to remember, literally. Oh how wonderful! I was just thinking about childhood memories of my own and they do seem to be similar to yours...warm stones, scratched up legs, running around outside. My parents always said that all my sister and I needed to amuse ourselves was a body of water...and the Alps has some of the most beautiful ones! That was a great heartfelt post. Thanks for sharing. The salt potatoes sound neat and different. I hope my children feel the same way about our place in Henderson Harbor, just a quick boat ride away from Chamount. Thank you for sharing your past with me.